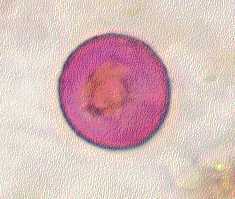 The pollen grains of Juniperus ashei are spherical and range from 21 to 25 micrometers in diameter. The exine (outer pollen wall) is relatively thin, while the intine (inner pollen wall) is thick. In contact with water or aqueous environments, the intine will swell and often ruptures through the exine. Although the exine appears smooth under low magnification, the outer wall is irregularly flecked with granules. These are visible in electron micrographs. The pollen is released from the microsporangiate cones (male cones) in large amounts during suitable conditions in December and January. The allergenic protein has been identified by several researchers as a glycoprotein with a molecular weight of 41,000 to 44,000 daltons.